Meet this group of amazing volunteers here at AMAUTA Cusco, Peru. 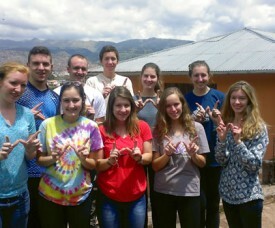 Hailey, Alex, Allison, Bill, Cayla, Chloe, Dan, Emily, Kelsey, Madalyn, all came from the University of Wisconsin-Madison in the United States to participate in the AMAUTA Volunteer Program in Peru. This group of young college students spent two weeks with us here here in Cusco and made a big impact on our local after-school project that is located in the outskirts of the city in the mountains. On the photos of this volunteer project in Cusco, you can see inside the local after-school project and what it looked like before the group of volunteers did their magic. If you are seeking cultural enrichment, language acquisition and a place to have fun, look no further than AMAUTA Spanish School in Peru. With Spanish teachers who have a strong passion for immersion and language learning you can depend on AMAUTA to help you become more confident in communicating in Spanish. 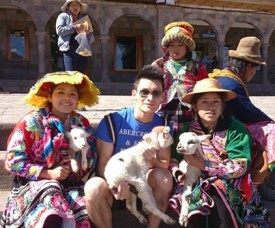 I personally attended the school located in the city of Cusco, surrounded by Andean mountains, at Calle Suecia. From school it was just a short walk to the ancient ruins of Sacsayhuaman as well as to the Plaza de Armas of Cusco. AMAUTA Skype lessons : your own Spanish teacher online! 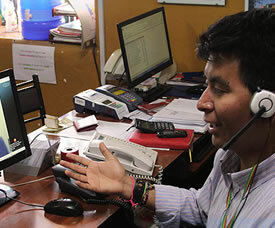 AMAUTA does not only offer Spanish in Peru and Spanish in Argentina. We also offer Spanish classes in your own house, at the time thats most convenient for you, at your own pace : Spanish via Skype! This is a great and very affordable way to improve your Spanish skills. Our experienced teachers in Peru will make a study plan with you and topics of your personal interest can be included and prepared. Our Spanish Skype lessons are not only for ex-AMAUTA students or future AMAUTA student – a great way in both cases to either continue your classes with your teacher, or, to know your teacher before arrival to either Cusco or Buenos Aires. Buenos Aires is a small piece of heaven for those who love to shop. 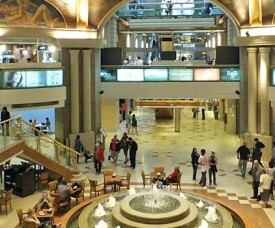 You can shop till you drop in the Argentine capital that has thousands of stores at your disposal. Some prices compare with those in Europe or USA but others are definitely lower. Not all our Spanish students have a big budget for shopping but no worry, here in Buenos Aires it is great fun to just visit the stores as they take you to the different neighborhoods of Buenos Aires making it a great way to explore the city of Buenos Aires. Every shop seem to have its own style and every neighborhood, its own kind of shops. So grap your Buenos Aires city map or open the Buenos Aires app on your smart phone and here we go. We’ll reveal some of the city’s nicest shopping secrets.